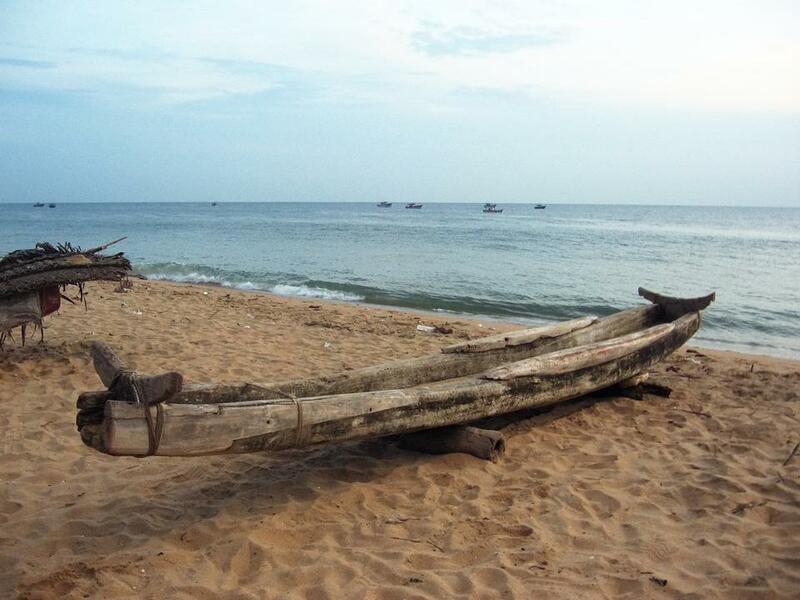 Catamarans, of the type used on the Coromandel Coast in India’s southeast and in Sri Lanka, close by across the Palk Strait, are subject to two kinds of misconceptions. The first is one of terminology. In its original meaning, kattu-maram (Tamil for “tied logs”) denoted a raft, not a vessel with two identical hulls, as the term is commonly understood. The erroneous transference of the term was probably made by an early European traveler who, being familiar with Indian catamarans, decided to call the twin-hulled boats he found in the Pacific by the same name, it probably seeming logical at the time to call any indigenous, non-European small craft by the same term. Henceforth, our use of the term will refer only to the raft. The second misconception concerns the nature of timber rafts, which are commonly conceived to be rectangular, flat, and capable only of drifting with the current rather than being directed according to the boatman’s wishes. Catamarans are, specifically, shaped rafts of wood or bamboo, and they behave more like true boats than like the flat, rectangular platform upon which Huck and Jim floated inexorably down the Mississippi. Model of a jangada (source). Click any image to enlarge. In Water Transport: Origins and Early Evolution, James Hornell describes several varieties of catamaran on India’s east coast and in many other parts of the world. Such craft are still in use in some locales. We have written about the jangada, a Brazilian catamaran in current use, and one can easily find with a Google search contemporary images of catamarans of more than one type on Sri Lanka. Hornell also distinguishes between catamarans that are more or less boat-like. In the Sri Lankan type that he calls “boat catamarans,” the central of three logs extends below the outer two, forming a keel, while the upper surfaces of the outer ones are considerably higher than that of the central one, forming an inside space that could be termed a hold or cockpit. In contrast to this, he describes the “flying fish” catamaran of Coromandel, which is the main subject of this installment. While it lacks a keel, it has enough of a depression in its upper surface to have an identifiable “inside,” and it is considerably more shapely and boat-like than the common conception of a raft. 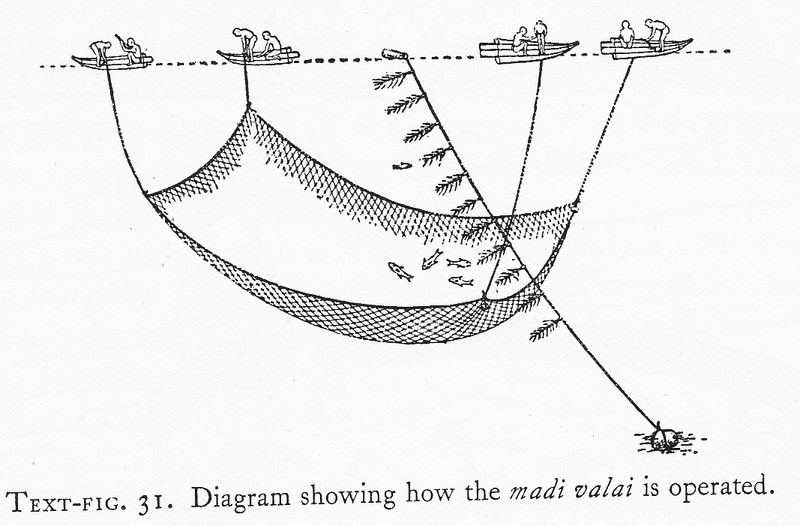 In Fishing in Many Waters, Hornell describes in detail the flying fish type and its use, which he observed in the Tanjore district. Pursuing flying fish requires sailing to deep waters as far as 25 miles from shore with a crew of seven and staying out for as long as three days. As such, the deep sea catamaran is a substantial vessel, averaging 30 to 35 feet long. They are built of seven main logs of light wood, dressed on all sides and tapering from back to front and from bottom to top. Curved logs are selected, so that, when assembled, the main section of the raft is an isosceles trapezoid in plan view, and dished both longitudinally and transversely. The logs are lashed together with coir rope. At the forward end, says Hornell, “the completed craft becomes definitely wedge-shaped in plan after the addition of an elegant upturned prow of five pointed pieces cleverly jointed on to the forward ends of the seven main logs.” Another log is lashed atop the outermost log on the starboard side to serve as a working platform. The two-masted rig is refined, although it looks crude as a result of the materials from which it is made. Short masts fit into sockets on the whichever outside log happens to be to leeward, hoisting lateen or settee sails. The head of each cotton sail is lashed to a long yard with a short downward-curving extension at the forward/lower end. The foot of the sail is lashed to a boom that extends only as far forward as the mast. Between the mast and the end of the extension-piece of the yard is a foot-rope. The sail, however, does not extend all the way to the forward apex of the triangle. Its forward corner or tack is cut off short, so that the sail has a very short luff. 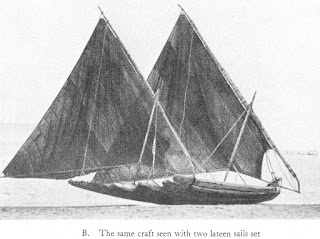 As to control lines, “Each sail is provided with a sheet and a vang or guy made fast to the upper end of the yard.” The sail can be furled by rolling it up around the lower boom, and by moving the grommet from which the yard depends down from the masthead onto one of a series of notches provided for the purpose. The boat is equipped with paddles and oars for when the wind fails. Two dip nets, consisting of a rectangular piece of netting (measuring 5’6” x 4’9”) with its short sides tied to poles about 7’ long, are carried. 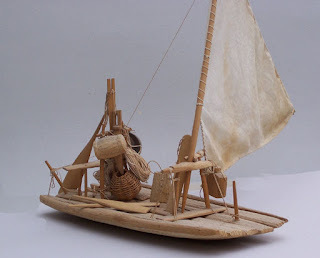 The rest of the equipment is limited to spare rope, a jar of drinking water, a bundle of cooked rice, a scoop to throw water on the sails, and three large bundles of bushes or shrubs, the last of which are key to the curious method of fishing practiced. Flying fish are attracted to the bundles. After a large number of fish have gathered, one of the bundles is pulled in slowly and carefully. The fish follow until it is close to the raft, at which time the dip nets come into play. Each net is operated by two men, one per pole. The net is dipped into the water nearly vertically, then brought up under the fish and tipped back so that the fish fall into the boat – the whole proceeding being performed in silence so as not to disturb the fish who remain beside the shrub bundles. When that group of fish has been disposed of, the next bunch of shrubs is hauled in and the process repeated. According to Hornell, the attraction that the bundles hold for the fish is neither their shade nor the expectation that they harbor small prey upon which to feed. Rather, the fishing occurs during the flying fishes’ spawning season, and the bundles replicate the bunches of seaweed upon which they normally deposit and fertilize their eggs. Large quantities of flying fish may be caught by this method over the course of two or three days. Fish that are not eaten fresh are sun-dried, but given the long distance that the rafts sail from shore, it often occurs that the catch may spoil before it reaches market. A long length of coir rope is made up with many strips of palm leaf between the strands, making a bushy appearance. (We presume the rope appears far bushier in practice than in the illustration.) One end is tied to a stone anchor or heavy bunch of turf; the other to a piece of light wood as a float. The anchor rope is dropped in “several fathoms of water” in an area where current is prevalent, and allowed to remain until fish collect in its shade. A large rectangular net is suspended at its corners by four ropes, the upper ends of which are held by a man in each catamaran. 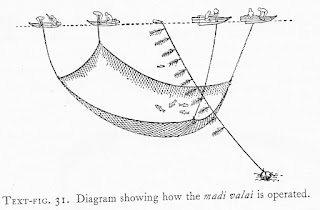 Moving against the current, the four boats approach the suspended shade rope from downcurrent, with the forward edge of the net held low and the after edge high. When the men in the forward two catamarans feel the net contact the shade rope, they begin to pull it up as quickly as they can, gathering the fish that have collected in its shade. 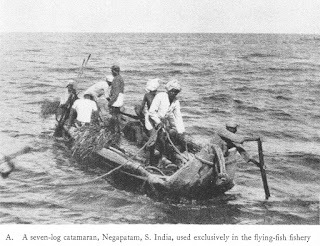 Although catamarans are still fished in Sri Lanka, I do not know if either of these methods from the Coromandel Coast are still in use.